The world has become so small that it compels us to have our thinking become big, if we are ever to make the big dream come true. EAL Film Program for Introduction to MS Academic English (Mrs. Guarnieri Rosso’s class): Students are required to attend the second film session today, February 8, from 15:30–17:30 and tomorrow, February 9, from 10:00–12:00. They will be watching Hugo Cabaret. 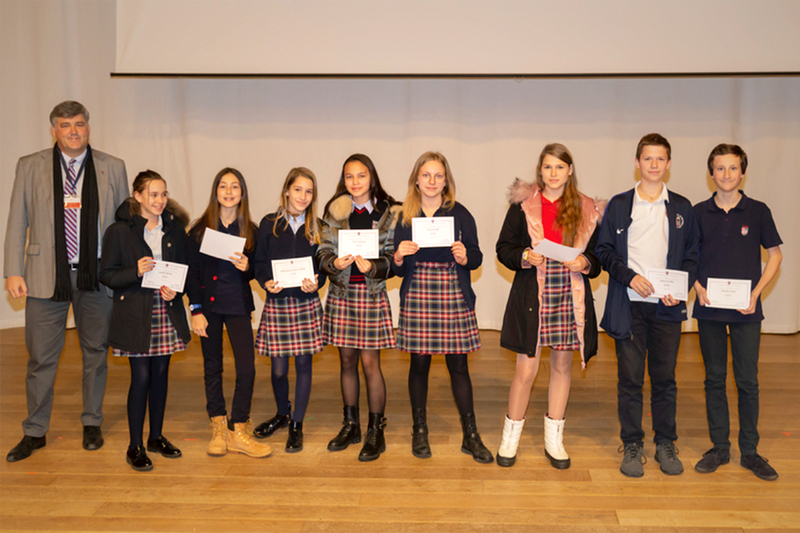 On Wednesday, February 6, the Middle School held the Fall Semester Academic Awards Ceremony to congratulate students who were named to the Honor Roll for the first semester. The Academic Honor Roll is calculated at each end-of-semester grading period. It is based solely on grades earned in classes and does not take into account effort grades or behavior. Honor Roll status at the semester is recorded on the recipient’s final transcript. During the MS Assembly on Wednesday, February 7, students reflected on the first semester and set goals for the second semester. 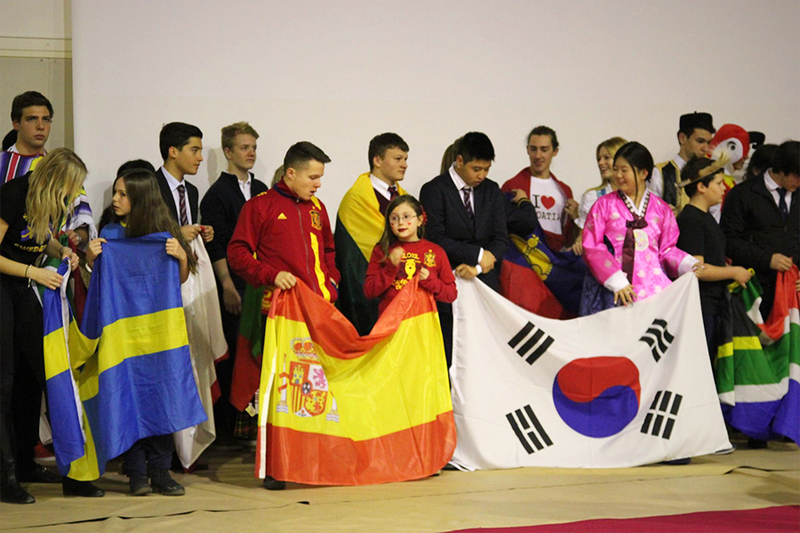 Students also reviewed all the details of International Week. There is a lot of excitement in the air! 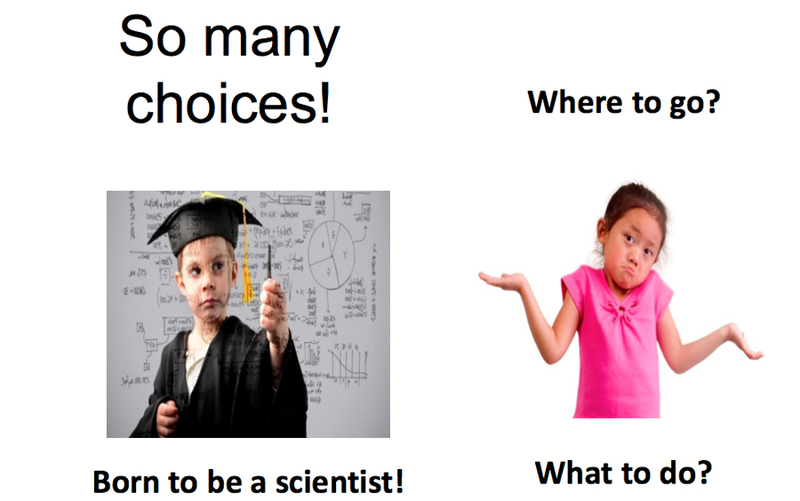 Please see the presentation slides from the meeting for more details. The Middle School will hold parent-teacher conferences on Wednesday, February 20. Students will be dismissed at 12:20, shuttle buses will depart at 12:30, and car drivers can pick up students at 12:40. There will be no after-school activities that afternoon. MS day students can’t remain on campus during parent-teacher conferences without adult supervision. The first conference session will begin at 13:15. We will have the session sign-up portal available on Friday, February 15. There will be four one-hour sessions. We look forward to seeing you on February 20. A Presentation on Digital Citizenship will take place on Wednesday, March 6, from 19:00–20:00 in the Palmer Center. The meeting will be led by MS Tech Coordinator Ms. Amy Bloodworth. MS Ski and Snowboard Club: The second ski and snowboard outing will be on Sunday, February 10. The third and fourth outings will be on February 17 and March 10. MS Musical: Tuesdays and Thursdays, 16:00–18:00. Performances will be May 17–19. Don’t Miss the Valentine’s Day Celebration Tonight! 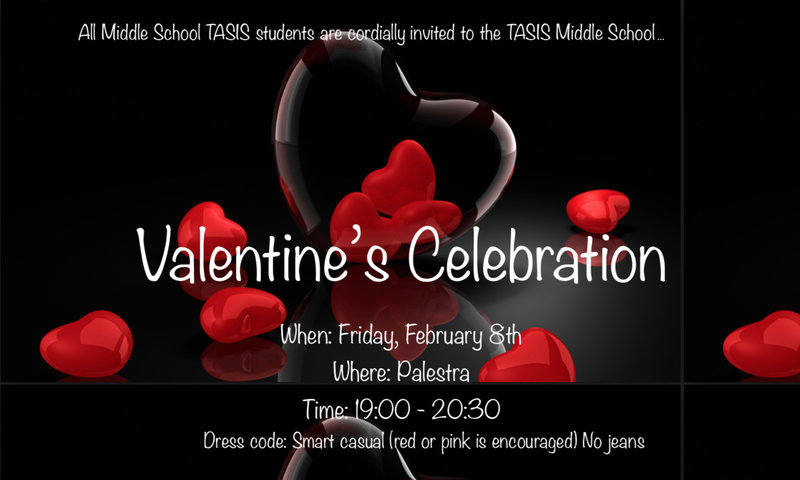 MS students will be celebrating Valentine’s Day in the Palestra tonight, February 8, from 19:00–20:30. Students are required to arrive by 19:00 and will not be allowed to leave until 20:30. We hope many students will participate! International Week Begins on Monday! 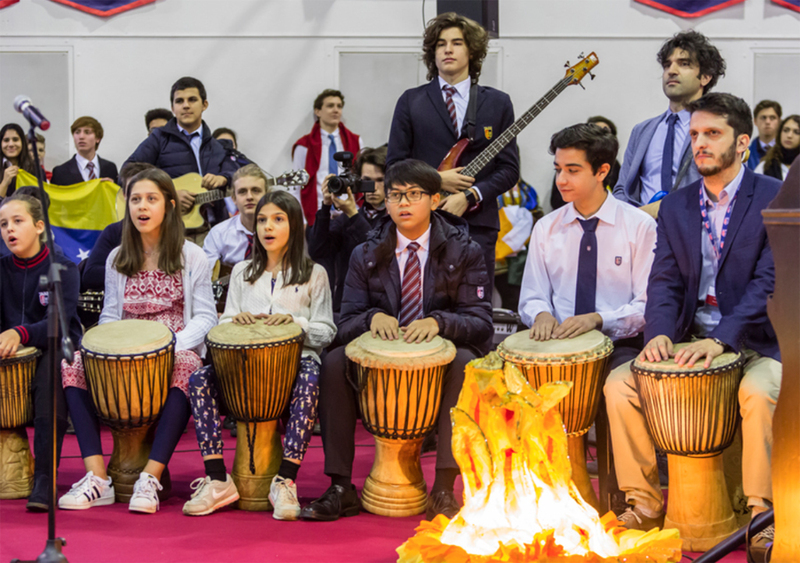 International Week, a favorite annual TASIS tradition, will begin on Monday, February 11, and conclude on Friday, February 15. Please see the MS schedule of International Week events. There will also be themed lunch and dinners in De Nobili for MS and HS students every day of that week. International Brunch: Our annual MS International Brunch will be held on Thursday, February 14, from 9:05 to 11:00. To make this event a successful one, family participation is essential! We would appreciate you making delicious homemade traditional dishes to share with our MS community. MS World Cup/Soccer Tournament: The Poverty Awareness Service Learning Group is holding the MS International Week Football Cup for the seventh consecutive year. The winning team will have its name inscribed on our official trophy and receive a special prize. All proceeds will support our chosen beneficiary, Gram Vikas, an organization that works with rural communities in India. 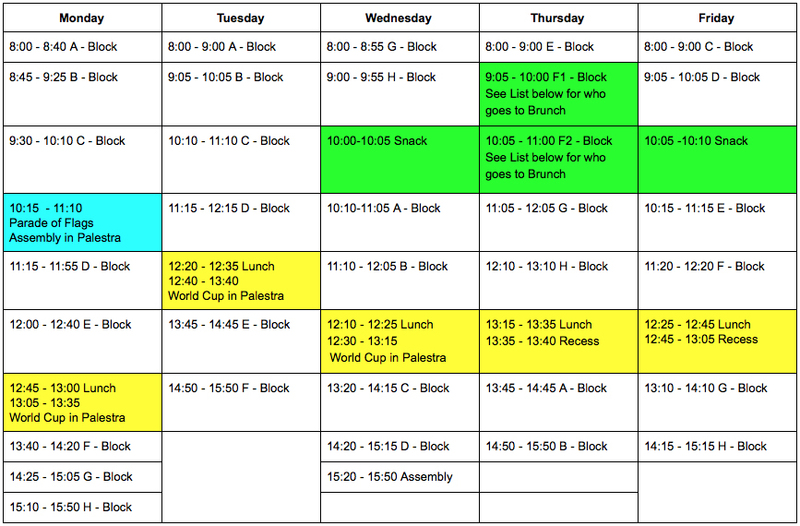 Alternate Schedule during International Week: We will be running an alternate schedule for International Week. There will be no After-School Activities that week except for the MS Musical rehearsal on Thursday, February 14. 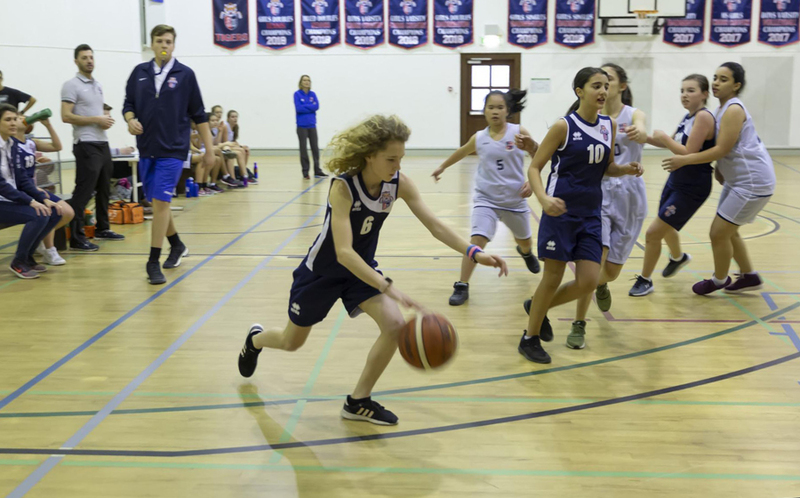 MS Academic Travel is part of the TASIS curriculum and is required for all 6th-grade students. This spring the students will visit Zurich from February 25–27. Please see the packing list. If you plan to take your child directly to the hotel in Zurich on February 25 or pick him or her up on February 27, please email your child’s advisor and Ms. Breton with the specific information at least five days before departure. If your child is a day student and needs to take medication during Spring Academic Travel, it is important that you talk to the advisor beforehand. MS Winter Adventure in St. Moritz (February 25–March 1) is required for all students in grades 7–8, as it is a core part of the MS Curriculum and the TASIS experience. Please see the packing list. Snowboarding during MS Winter Adventure: Please take note that during MS Winter Adventure, beginner snowboarding classes will not be offered due to safety precautions. If your child is a day student and needs to take medication during Winter Adventure, it is important that you talk to the advisor beforehand. Two school nurses will also be available on site. Portrait retake day will be held on Monday, March 4, from 10:00–16:00 in the MCF Library for any students who did not have their portrait taken in October. This photo will be used in the Yearbook and in Veracross, so it’s very important that students remember to go. Seven members of the TASIS Faculty (and four Elementary School students!) 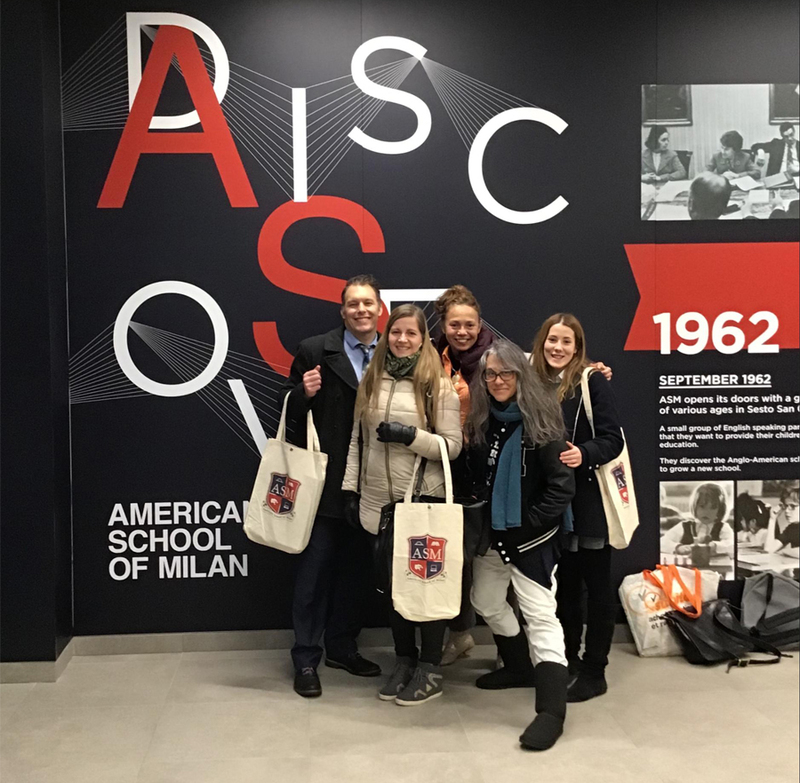 attended the fourth Milan International Teachers Association Conference on February 2 and returned to Lugano with knowledge, techniques, and inspiration to share with their colleagues. Learn more on the TASIS Blog. Acclaimed screenwriter and playwright Michael Lesslie—the third TASIS Speaker Series visitor this year—discussed his writing process and circuitous path to success with students and guests in the Palmer Center on the evening of Tuesday, February 5. Enjoy the full address above.